Hello! As I am soon going to complete my tenth trip across to pond to get from home to school, or vice-versa, I thought I would list out all the things I try to do to be as comfortable as possible on the journey over and how I deal with jet lag. As you probably know, it can get really cold on planes, the aircraft is full of germs, and you get very dehydrated. I normally will wear a t-shirt with a sweater and a large scarf allowing me to manage my temperature better. Although it is inconvenient to have to use the aircraft toilets, trying to drink as much water as possible is a good idea. 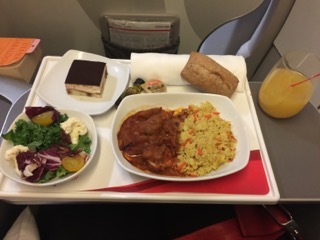 I also try to eat a little bit throughout the flight so that I can eat at a reasonable time once I land. In either Country I try to not sleep until a reasonable time and eat at the times I am meant to in that time zone so that I can avoid jet lag. I’ve not had too much trouble with jet lag up until now except sometimes being hungry at odd times. I typically fly with Westjet as their flights are often cheaper than Air Canada, so I thought I would share with you the differences I’ve experienced flying with the two airlines. Hopefully this blog can help you be a little more comfortable on your flights to and from England and can maybe even help you choose which airline to fly with.